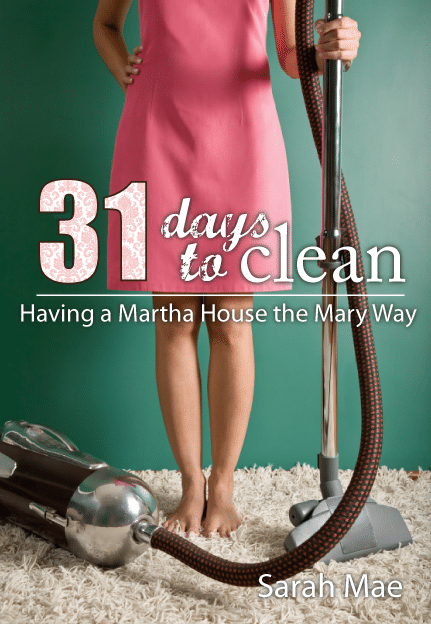 Today I am starting the 31 Days to Clean book written by Sarah Mae. I am very excited to start this book because I really need to get my house, life, and time under control. "I struggle with managing my home well. Cleaning does not come naturally to me; in fact I think my DNA is allergic to it. " and from that sentence on I knew that Sarah Mae and I were kindred spirits! I have been married for 21 years and I have struggled with keeping my home clean, decluttered, and organized since the very first day. I have gotten MUCH better over the years but it's still a daily struggle to do all that I feel I should be doing. Finding a balance between housework, family time, homeschooling, and cooking/baking has always seemed an impossibility to me. "The heart of our home is not in the ability to keep it perfect at all costs; the heart of the home is love." I knew that this book was written to my very feeble, insecure, imperfect heart. See, I want a perfect home, decorated just so, spotless with everything having a place and everything in its place. I also want to cook 3 meals a day from scratch, make my own bread and whip up a special treat that my family will love. I want my laundry to be caught up, my children to have the most amazing education possible, my husband to be amazed at his Proverbs 31 wife, and I want to always be there for anything that my family or friends need. Unrealistic dreams... ABSOLUTELY! But just because I realize they are unrealistic does not mean that I stop having them and unfortunately that also means that I do not stop beating myself up because I cannot achieve them! My prayer is that this book will help me, not only to better maintain my home, and set me up for success in keeping the kind of home my family desires to have and I desire to give them. But more importantly teach me to show my family Jesus every single day. Whether that be by taking on the heart of a servant and washing floors, or by taking on the role of a teacher and sitting with a child until they understand a hard math concept, or by taking the role of comforter and listening to a broken-heart. Because I am fairly certain that my children and my husband will focus less on the mess and more on the message that Mama is showing/living/teaching everyday.